Self-Care is often overlooked for a variety of reasons. It is so important for every single person. Why is it so easy that we all-too-often think we don’t have time, that we are too busy, to practice self-care? Personal self-care involves many different aspects of your overall being. As a matter of fact, personal self-care means you need to take care of yourself inside and out. By doing this, you’ll not only feel better about yourself, but you will increase your ability to cope with all that life demands of you – all of us – today. If you are not mindful of your own self-care, your thoughts and feelings and needs, your body and spiritual needs, then you could be looking disaster right in the eye. This disaster can come in the form of emotional and physical distress. We live in a hectic and ever-challenging and stressful world. Whether your greatest stress comes from the microcosm of your life or from both your own day to day stresses and the overall world chaos of the macrocosm of stress that has to be dealt with and effectively coped with. Both require active aware and mindful self-care practice daily. Eat Healthy Foods – Incorporate as many raw foods as possible, such as fruits and vegetables. They contain the essential nutrients needed to function at your best, both physically and mentally. Try to have a diet that consists of at least 60% raw foods, if not more. Pay attention to food labels and what you are actually consuming. Consider, if you haven’t already cutting down on meat or becoming a vegetarian. Exercise – Exercising just a few days a week can make a huge difference in how you feel about yourself, both mentally and physically. You’re doing something healthy with your body and you’re also releasing endorphins that are known to make you feel much more positive and reduce stress. Walking more, can be a great way to start exercising more. Quality Sleep – Make sure you get enough sleep at night. Sleep deprivation can make you nervous, cranky, and prevent you from thinking clearly. Lack of sleep is a well-known stressor. It can cause not only more stress, difficulty regulating your emotions and/or moods but also can cause more physical accidents. Prayer and Meditation – It is important to have a connection to something or someone higher than yourself. Prayer puts things into perspective and provides balance. Self-Reflection – Self-reflection is important because it allows you to become much more self-aware and create wanted/needed change in your life. Focus on the things that are positive for a good sense of well-being. Mindfully meditate and reflect on that which is positive and helps you to de-stress and flow with an inner-calmness that is so healthy for your mind, body, and spirit. Alone Time – Make sure you make time for you. Everyone needs some down time to relax, recharge, and be with self. You can use this time to write in a journal, pray, or meditate. You can also read, go for a walk. Alone time is important – solitude – at least once a day – 30 minutes or 15 minutes twice a day. It’s about just being. We re not human-doings. 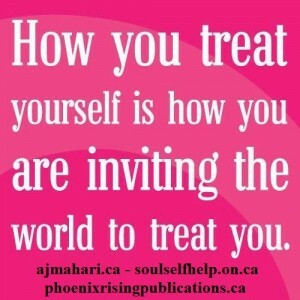 Respect yourself – In order to effectively practice and create healthy habits of self-care you need to have self-respect. This self-respect you need to give to yourself not for all of the things you do in your life. Respecting yourself is about being who you really are and loving yourself. Being kind to yourself. It is an inside job. Exercise Your Brain – You will benefit so much from constantly stimulating your brain. You can practice this aspect of self-care by doing puzzles or playing computer games that involve some sort of strategy. Doing this will keep you sharp and confidently prepared for any and all challenges in your life. Social needs – Personal relationships are very important; after all, we all need social interaction. Enjoy time with yourself, but it’s important to also enjoy time with friends, family if you have healthy family, and also time spent with co-workers, pets, and in recreational activities or interest groups you can take part in to interact with others. Be Organized – Keep your life tidy enough to be organized and functional for you. Set up a routine in which you can actively incorporate these personal self-care tips into your day. Make an appointment with yourself each and every day. Just as you make appointments for work, to meet with friends and pursue other things. What could be more important than being organized enough to make time for your own self-care? 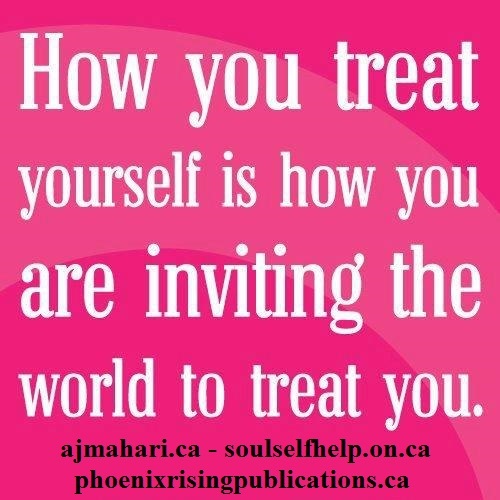 Many people find trying to focus on their own self-care to be either too difficult or feel as though it is too selfish. Yet these same many people, then wonder why they feel so exhausted, depleted, stressed, and often taken advantage of. You will benefit from tapping into your subconscious thoughts and feelings and needs so that you can and will have a daily self-care routine that keeps you healthy, in mind, body, and spirit. Be a human being, not a human (constantly) doing. Slow down for part of your day. Take time to give yourself the gift of down time, personal time, alone time. The benefits of doing so are really endless. You are worth this time. You deserve this time and to take great care of yourself. © A.J. Mahari, April 3, 2015 – All rights reserved.